You are here: Home / Emotional wellbeing / Summer. Body. Whatever. 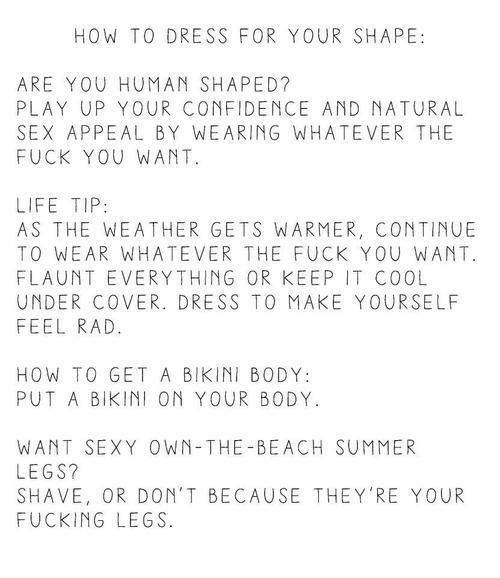 Sorry for the language below… BUT I really like this message. I’m seeing so many articles / blogs / images / ‘inspo’ at the moment about the urgent importance of changing your physical self to match the warmer weather. Seriously. It puts so much pressure on people – particularly women – to achieve an ‘ideal’ (and not often achievable) look. The underlying message being: you’re not beautiful or acceptable unless you get a flat stomach, fit into a size tiny bikini and show off your toned and tanned pins in seriously short shorts. Mate, this is not the place happiness springs from, NOR health. If you want a six-pack for summer, great, hop to it – I fully support your choice. However, if that’s NOT you – also great – I fully support you too! I feel strongly about this topic and have had ranted about it before – here and here. By the way, I absolutely agree that the alarming rise of obesity and chronic disease within Australia needs to change. That change needs to happen now. And I’m certainly not advocating avoiding healthy interventions or discussions around weight, health and nutritional management. However, what I do get antsy about is this weird habit of promoting unrealistic ideals, extreme diets and short-term interventions to ‘improve’ ourselves cosmetically. These have nothing to do with health and wellbeing and rarely promote the practice of cultivating changes that can become life-long health habits. Well now that all depends on the content of the program/article 😉 we run a 6-week program that may be called a ‘bikini overhaul’ but when you unwrap it, there’s an amazing education program that empowers women and inspires a whole community, with lasting impact. It teaches women how to eat mindfully and find out what makes them feel good, gives them some insight into how to source and prepare food that’s healthy and nourishing and is also full of helpful acceptance and positive living techniques. So although ‘bikini’ may be the sell, ‘wellbeing’ is at its heart… and we never talk ‘calories’. This program has literally changed womens’ lives, helping them to take control and find a little self-love along the way. Each to her own and I don’t think that making those who DO decide to join one of the countless summer bod programs out there feel like they’ve done a silly thing is very helpful. You’ve raised some really good points. I certainly agree with you that there are heaps of health-focussed promotions and programs that aren’t bad at all, for example the one you run sounds great. And I would certainly never want to demonise or ridicule someone if they did decide to hop on board with a ‘drop a dress size in a week’ (for example) program. What someone chooses to do is their choice and I fully respect that. What I take issue with – which I think sounds similar to you – is the unrealistic expectations and immense pressure put on (mostly) women (but also men) to achieve certain physical markers that equal ‘beauty’ ‘happiness’ and ‘health’… when in fact, they offer none of those things, don’t empower people with knowledge that will serve them well, nor instill healthy habits long-term. Enjoy your weekend and thanks again for your comment.